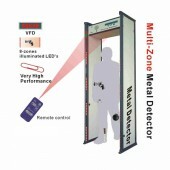 Nowadays lots of equipments has been used for security inspection, among them the Multi-Zone Walk Through Metal Detector is especially excellent. The appearance of this Multi-Zone Walk Through Metal Detector is made of high strength synthetic materials, so it is with high quality. Besides it owns 6 display areas that owns with single or multiple areas showing the metal position and built-in high brightness diode indicator light is applied to indicate the alarm area exactly. Besides it owns adjustable high sensitivity which can be adjusted from 0 to 99. And it possesses the ability of recording the alarming times and number of people passed, which is really a good function. And by adopting the advanced digital self-balancing technology the omission and misinformation problem has been overcome. But for these merits, because of the separated power design it can work as normal even under extremely unstable voltage conditions. Besides it owns water and damp proof function with fixer equipped at its bottom. And it will do no harm human body, pregnant woman or software products. Can’t help to buy one? So come to detectorall and contact us, add one to your chart. Then we will offer the product with both high quality and reasonable price for you. The service of your clerk is thoughtful and satisfying, it is really a happy purchasing experience, hope that we can cooperate in the future again. It is advanced in design and is of good quality, I like it very much. Over all a perfect choice of product and purchase place!